Powerback RFD2 Rubber Duct Protectors are ideal for lightweight vehicles, carts and pedestrian traffic in public, commercial and industrial areas. 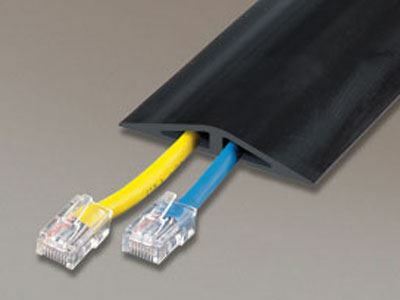 These two channel protectors are designed to protect multiple communication lines or small 14 through 22 gauge wires located in walkways or work areas. They are non-metallic, flexible rubber protectors that allow you to organize portable cords and cables while reducing trip hazards. Protector is supplied unslit but can be slit on the bottom for easy cord insertion.